He married Sarah Lucy Millikan1,6,8,13 [Lucy Millikan5], Nov 21 18891,6,8,13, Randolph County, North Carolina1,6,8,13. Sarah was born Mar 30 18651,5,8 [about 18646], North Carolina1,5,8. Hinshaw, Thomas, head-of-household, age 34, born Feb 1866 in North Carolina; parents born in North Carolina; married 10 years; occupation: farmer; owned farm (free). Hinshaw, Sarah L., wife, age 35, born Mar 1865 in North Carolina; parents born in North Carolina; married 10 years; 4 children, 4 living. Hinshaw, Estella, daughter, age 9, born July 1890 in North Carolina; parents born in North Carolina. 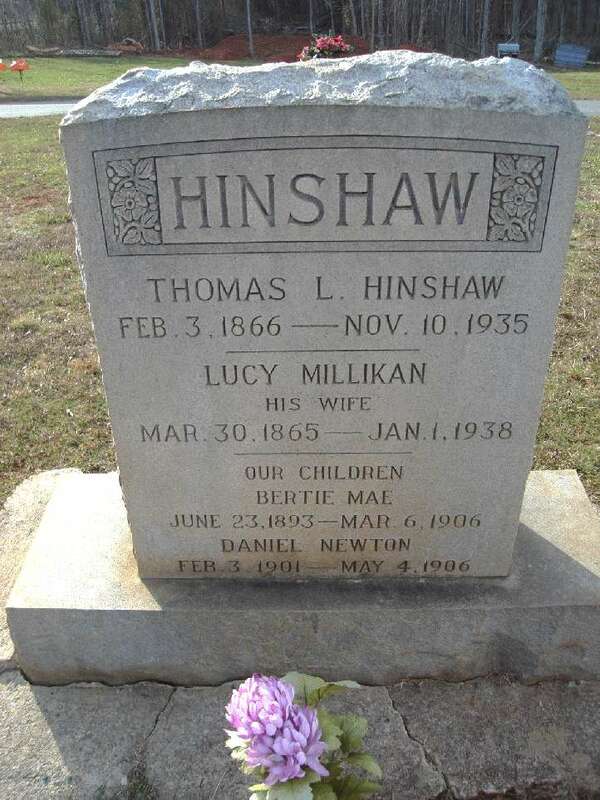 Hinshaw, Berty, daughter, age 6, born June 1893 in North Carolina; parents born in North Carolina. Hinshaw, Jennie, daughter, age 4, born July 1895 in North Carolina; parents born in North Carolina. Hinshaw, Guy, son, age 2, born Mar 1898 in North Carolina; parents born in North Carolina. Hinshaw, Thomas L., head-of-household, age 45, born in North Carolina; parents born in North Carolina; first marriage, married 21 years; occupation: farmer, home farm; owned farm (mortgaged). Hinshaw, Sarah L., wife, age 46, born in North Carolina; parents born in North Carolina; first marriage, married 21 years; 5 children, 3 living. Hinshaw, Jennie, daughter, age 14, born in North Carolina; parents born in North Carolina; attended school. Hinshaw, Thomas G., son, age 12, born in North Carolina; parents born in North Carolina; attended school. Hinshaw, James M., son, age 6, born in North Carolina; parents born in North Carolina. Hinshaw, Thomas, head-of-household, age 53, born in North Carolina; parents born in North Carolina; owned home; occupation: farmer, general. Hinshaw, Lacy [?unclear], wife, age 54, born in North Carolina; parents born in North Carolina. Hinshaw, Guy [unclear], son, age 21, born in North Carolina; parents born in North Carolina; occupation: weaver, cotton mill. Hinshaw, James [unclear], son, age 16, born in North Carolina; parents born in North Carolina; attended school. Hinshaw, Tom L., head-of-household, age 64, born in North Carolina; parents born in North Carolina; first married at age 22; owned home ($600 value); no radio in home; occupation: farmer, own; not a veteran. Hinshaw, Sarah L., wife, age 65, born in North Carolina; parents born in North Carolina; first married at age 24. Hinshaw, Guy T., son, age 32, born in North Carolina; parents born in North Carolina; single; occupation: salesman, service sta. ; not a veteran. 1900 census, Randleman Township, Randolph County, North Carolina; roll T623-1213, ED 94, page 3B, line #77, dwelling #54, family #55. 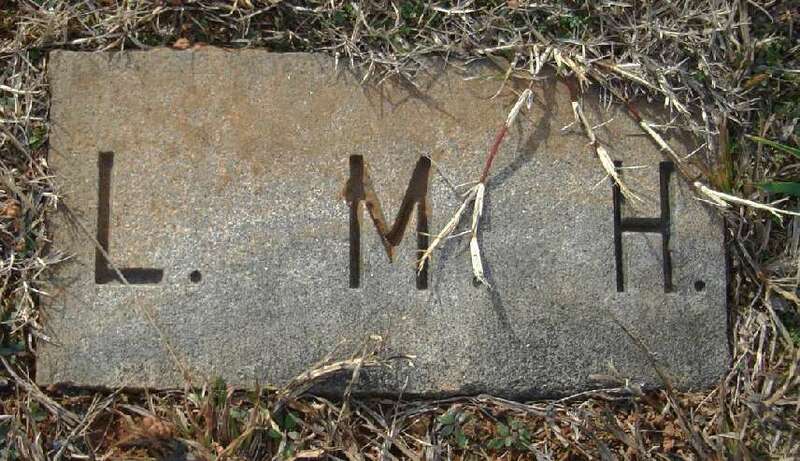 Thomas L. Hinshaw family gravestone; photo courtesy of Crystal Dawn Eaton Cooper (). 1910 census, Randleman Township, Randolph County, North Carolina; roll T624-1128, ED 95, page 3A, line #23, dwelling #52, family #52. 1920 census, Randleman Township, Randolph County, North Carolina; roll T625-1318, ED 112, page 6B, line #91, dwelling #109, family #109. 1930 census, Randleman Township, Randolph County, North Carolina; roll T626-1715, ED 27, page 1A, line #21, dwelling #5, family #5. 1900 census, Randleman Township, Randolph County, North Carolina; roll T623-1213, ED 94, page 3B, line #83, dwelling #55, family #56. 1900 census, Randleman Township, Randolph County, North Carolina; roll T623-1213, ED 94, page 3B, line #73, dwelling #53, family #54. 1900 census, Randleman Township, Randolph County, North Carolina; roll T623-1213, ED 94, page 3B, line #67, dwelling #52, family #53. 1910 census, Randleman Township, Randolph County, North Carolina; roll T624-1128, ED 95, page 3A, line #20, dwelling #51, family #51. 1920 census, Randleman Township, Randolph County, North Carolina; roll T625-1318, ED 112, page 6B, line #95, dwelling #110, family #110. 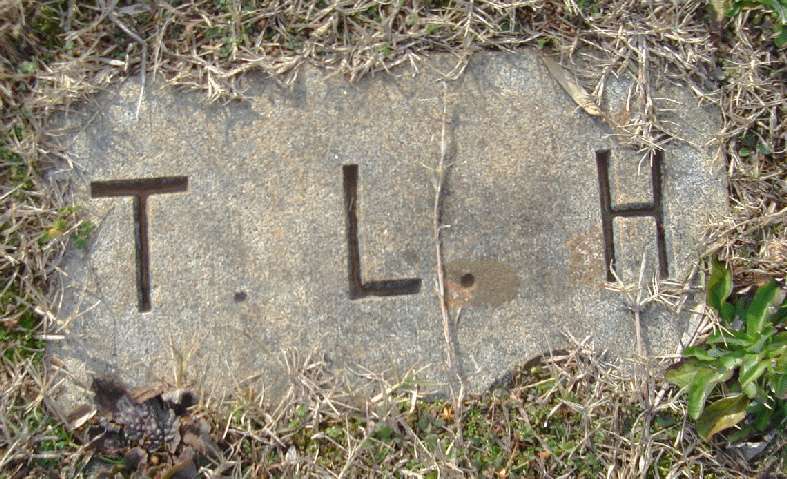 Thomas L. Hinshaw grave marker; photo courtesy of Crystal Dawn Eaton Cooper ().